News: sinkholes have been discovered in the residential neighbourhoods surrounding the construction site of one of the world's tallest skyscrapers – the 555-metre Lotte World Tower near Seoul by Kohn Pedersen Fox. The appearance of holes has been reported on at least two roads in the Songpa neighborhoods that surround the site, including one with a width of half a metre and a depth of 20 centimetres, located just 500 metres away. There are also claims that a lake overlooked by the tower has been mysteriously shrinking, with water levels said to have dropped from five to 4.3 metres. Designed by American firm Kohn Pedersen Fox (KPF), the Lotte World Tower has more than half of its proposed 123 floors in place. It is set to become the tallest structure on the Korean peninsula, and is also shaping up to be one of the top ten tallest buildings on earth. The skyscraper has been under construction for five years, but earlier this month city officials appointed a team of lawyers, engineers, architects, environmentalists and university professors to advise on the condition of the construction site, including its safety. Park Chang-kun, a civil engineering professor at Kwandong University, noted the presence of underground water pooling in the sixth basement level and suggested it may have come from the lake. According to Associated Press, Park said that water circulation underground could have accelerated due to the construction and warned that it could undermine the ground in the area, which accommodates hundreds of apartment buildings. Lee Won-woo, CEO of tower developer Lotte Moolsan, also told Associated Press that builders have been pumping water into the lake to maintain water levels. The Songpa district local government has ruled out the possibility that the tower can be to blame, but the Seoul city government is reportedly looking into how the water level of the lake affects the land in the area. 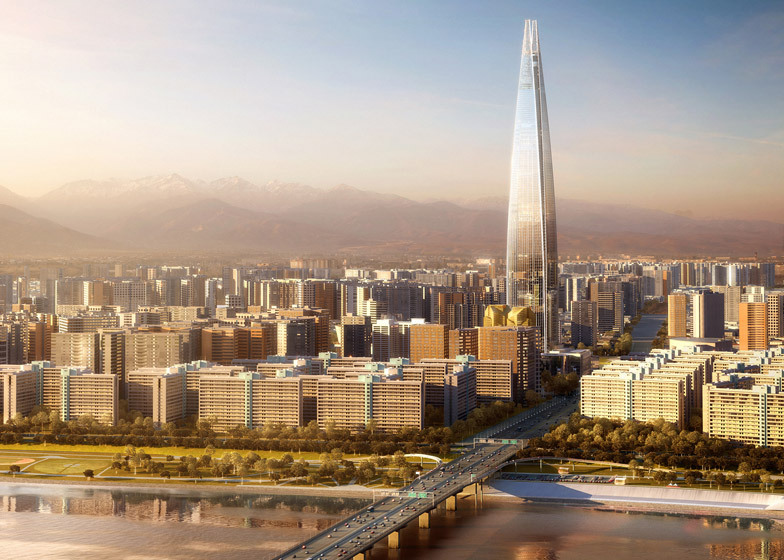 The Lotte World Tower is currently scheduled to complete in 2016, offering a mix of retail, offices and a hotel. The top ten storeys are earmarked for entertainment and leisure facilities, including an observation deck and a rooftop cafe. The building will feature a smooth tapered glass form, intended by KPF to reference Korean artistry. External materials will be finished in a light-toned silver glass, accented by white lacquered metal. KPF was unavailable to comment.